Grandma Juice and The Kids Are Grown are at it again! 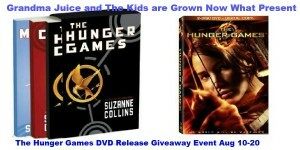 What’s hotter than The Hunger Games Trilogy right now? The upcoming DVD release of course! Well, here’s you chance to win both! That’s right! Win it before you can buy it. 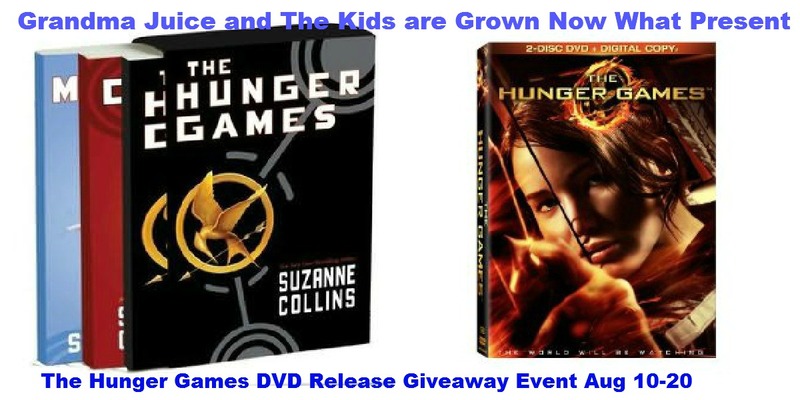 Hunger Games giveaway to keep it shorter and much easier for you to enter! All entries are optional except the first – Your Name and Email – so we know where to send that sweet winning notice. But, as always, the more you do, the more entries you get. Don’t forget the daily tweet option. Ready? Fill out the handy, dandy Rafflecopter below and you’re on your way! Finnick Odair is probably my favorite character. I know he isn’t until later in the series, but he just came across to me as easygoing and funny. I haven’t seen the movie yet, and I just started reading the books and I am not that far in the book to determine my favorite character yet…. Would love to win! Besides Miss Katniss, I <3 Cinna and the relationship he forms with her. Besides Miss Katniss of course, I <3 Cinna and the relationship that he has with her. Katniss, Gail, & Cinna. Thanks for the opportunity! I love Finnick. Definitely a surprising character. Katmiss, such a strong character. 🙂 Thank you. I do not know the caracters. I want to see the movies . The stories are popular so i am sure they are good. I heard on of the characters is a young female who is a real survivor. I imajine she will be a favorite. I haven’t read the books or seen the movie so I don’t know. I’m excited to find out though! I like Rue, she’s so sweet. And DVD Movie Giveaway Event. My Answer Is I Haven’t Read Any Of The Books Or Watched This Movie Yet So I Don’t Have A Favorite Character. Thanks For Having This Giveaway!!!!!!!!!!!!!! Katniss is a very strong character. She is my favorite. I love Katniss and Rue the most! I have never read the books or watched the movies, but I have heard so many good things about them. I don’t know! I haven’t seen the movie or read the books, but I want to!